The Jeep Gladiator will reign supreme at this year’s Easter Jeep Safari as the Jeep and Mopar brands have once again joined forces to create six new, custom-built concept vehicles for the annual event that takes place in Moab, Utah, from 13 - 21 April. For the 53rd year, thousands of off-road enthusiasts will head to Moab for the annual Jeep event to participate in a week of technical off-roading on some of the most challenging and scenic terrain in the country. A vast selection of production and prototype Jeep Performance Parts are among the highlights on this year’s collection of Jeep concept vehicles. The Mopar brand develops all Jeep Performance Parts with rigorous specifications and legendary 4x4 capability in mind. The Jeep Wayout concept takes advantage of the all-new Gladiator’s class-leading payload to allow adventure seekers to go far off the beaten path. The Jeep Wayout is a functional concept that showcases a full roof-top tent and custom, large sprawling canopy. Wayout’s body-armored exterior features a new Gator Green colour that will be available on production Gladiator models. A custom bed rack with an integrated ladder carries the roof-top tent that sleeps two comfortably, while the 270-degree awning with amber LED task lighting helps travellers set up camp when the day is done. For additional capability, a Jeep Performance Parts 2-inch lift kit increases ground clearance on top of 17-inch steel wheels that are hugged by 37-inch mud-terrain tires, providing a distinct retro feeling harking back the original Willys pickups that paved the way for modern Jeep trucks. The Jeep Wayout is powered a 3.6-liter V6 engine and mated to an eight-speed automatic transmission. Designed with the desert lifestyle in mind, the Jeep Flatbill concept is another fun look at the all-new Gladiator, mixed with the extreme thrills of the Motocross world – resulting in an unmistakable, loud and rowdy appearance that serves as the ultimate hauler for an array of toys. The Jeep Flatbill is a truck dedicated to dirt bike riding through-and-through and is fully equipped to handle transport of dirt bikes for any off-road adventure. With the removal of the tailgate, dedicated wheel ramps have been installed that slide out for easy access and loading. Custom body work on the bed lowers, plus the addition of a tube rear bumper, increases the vehicle’s departure angle for added capability. Large rear bypass shocks along with 20-inch wheels have been added, as well as 40-inch tires – the first time on any Jeep Gladiator. The Jeep Flatbill is powered by the 3.6-liter V6 engine with a cold-air Mopar intake and mated to an eight-speed automatic transmission. Headlights have been replaced with new HID lights along with LED auxiliary lights for vast outward visibility. Rearward, LED halo lights have been installed in the original tail light buckets. To protect the body, the original rockers were removed and replaced with functional rock rails that run the length of the body side. The M-715 Five-Quarter’s off-road capability has been enhanced by reinforcing the original frame and replacing the leaf springs with a heavy-duty link/coil suspension system. Additionally, the front axle has been pulled forward two-inches and replaced with a Dynatrac Pro-rock 60 front axle and a Dynatrac Pro-rock 80 axle in the rear, while 20-inch beadlock wheels are wrapped with large 40-inch tires. Power is provided by a 6.2-liter supercharged “Hellcrate” HEMI V8 engine which produces more than more than 520kW. The Jeep J6 is a Rubicon customized in a two-door configuration, maximizing cargo space with a large, six-foot functional bed “box” area that is 12 inches longer than the standard Jeep Gladiator bed. Mopar and the Jeep Design team reached back in time for the custom Metallic Brilliant Blue paint; a homage to the exterior look of the 1978 Jeep Honcho..
Additional modifications defend the Jeep J6 against off-road obstacles, including a prototype 2-inch steel stinger bar that bolts to the Rubicon front bumper and rock rails customized with 2-inch steel tubes welded to the standard Jeep Gladiator rails. The concept hard top is removable, and classic Jeep J6 badging is swapped in on the tailgate and side fenders. The 3.6-liter engine receives a performance bump through the Jeep Performance Parts cold-air intake and dual cat-back exhaust. The look of the early 1980s-era CJ8 Scrambler is recreated with prototype Punk’N Metallic Orange and Nacho body-side stripes running from the front panels to the bed, and a matching hood graphic. The white exterior is crowned with a freedom top painted in vintage amber, continuing the retro feel.Based on the Jeep Gladiator Rubicon, the Scrambler pulls liberally from the Mopar brand’s Jeep Performance Parts line, including a set of four, 5-inch LED lights stationed atop the sport/roll bar, and two stationed on the vehicle’s A-pillars. The Jeep Performance Parts 17-inch slot wheels are customized in a concept bronze to tie in with the exterior colour theme. A 2-inch Jeep Performance Parts lift kit helps accommodate large, 37-inch tires and tough Jeep Performance Parts rock rails feature a non-slip grip. The 3.6-liter engine is augmented with a Mopar cold-air intake and cat-back exhaust. 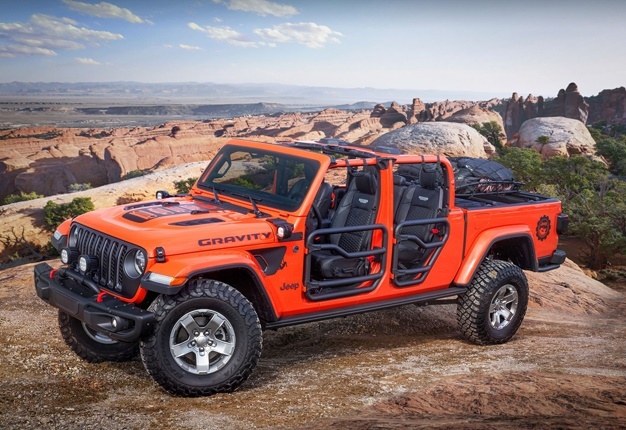 The rock climber-themed Jeep Gladiator Gravity concept is elevated with a full complement of available-at-launch Jeep Performance Parts from Mopar to help equip those who have a desire to reach greater heights. The Jeep Gladiator Rubicon, coloured in attention-grabbing Punk’N Metallic Orange, is a ready-to-order expression of how Jeep Performance Parts can help enhance the all-new pickup’s capability and versatility. The open-air potential of the Jeep Gladiator — unlike any other offered by a production mid-size truck — is realized through Jeep Performance Parts 2-inch round steel tube doors, a mesh sunbonnet that provides cover while keeping the top-down feel, and tie-down straps that secure the windshield when lowered. The Jeep Gladiator Gravity is raised with the Jeep Performance Parts 2-inch lift kit and runs on 17-inch gear wheels carrying 35-inch tires. Heavy-gauge steel Jeep Performance Parts rock rails are thicker and wider The vehicle is upgraded with a cold-air intake and cat-back exhaust system to enhance engine output. Inside, the interior is dressed up with Katzkin leather seats featuring the Jeep grille logo embroidered in Tungsten stitching. Additional Mopar accessories include grab handles stamped with the Jeep grille logo, MOLLE (Modular Lightweight Load-carrying Equipment) bags for storage and all-weather floor mats with a unique “plug” system that allows for direct draining of water and debris.